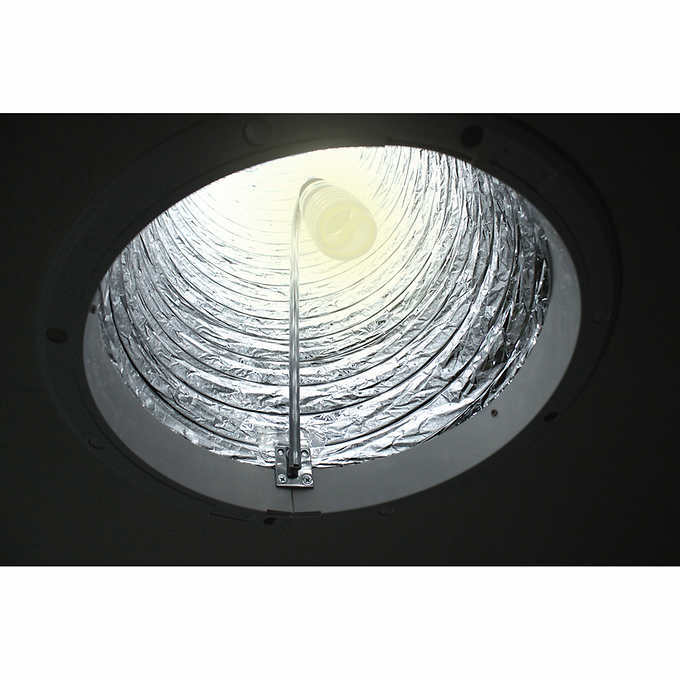 Direct clean, natural daylight and tunnel it to just about any location in your home or business with the low-profile, square dome Radiant Skylight Tube, or Spectrum Skylight Tubes - the first, patented Skylight Tubes offering a passive ventilation option. Exclusive, industry first, patented ventilation kit – add or remove ventilation feature in only seconds! With its elegant design, the Spectrum series will allow you to easily enable the ventilation option and just as easily disable it to create an air-tight non-ventilating, daylighting-only Skylight Tube. 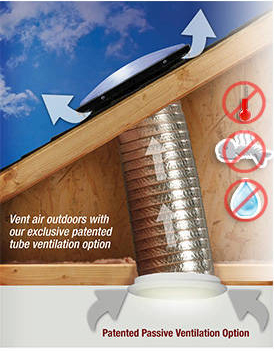 Our ventilation kit is included with every Spectrum Skylight Tube. 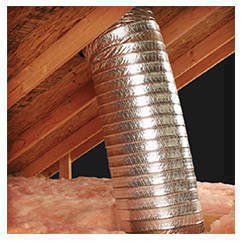 Our Spectrum Series ventilation kit is completely optional and easily enabled! 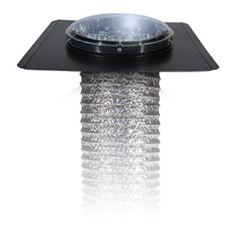 The ceiling lens ventilation configuration can be easily converted from a ventilated system to a sealed, energy efficient, non-ventilated daylight-only system. By simply removing the spacer magnets on the ceiling lens, you can enable or disable the ventilation option in only seconds. Simply add the spacer magnets to the ceiling lens to convert your non-ventilated, energy efficient Skylight Tube to a passive ventilator. This addition takes only seconds to complete and is easily reversible at any time. 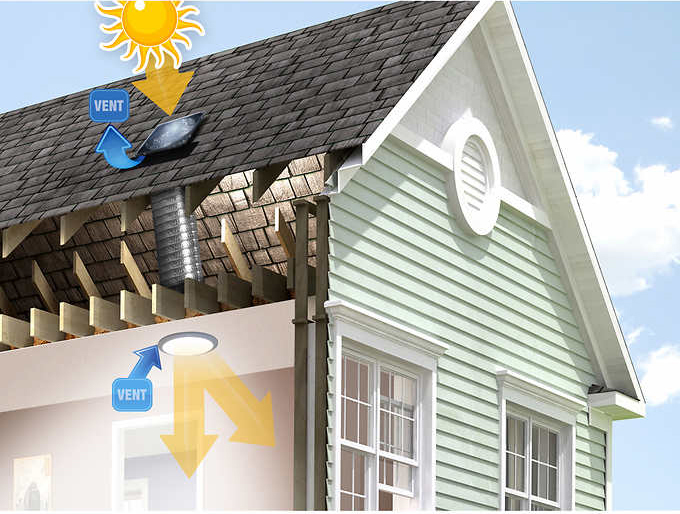 Use the roof dome ventilation tabs at installation to be able to have both energy efficient daylighting and passive ventilation whenever desired. Once the roof dome's ventilating tabs are installed, the Spectrum Skylight Tube can switch from energy efficient natural lighting to a natural light with passive ventilation. Simply install the spacer magnets tat the ceiling lens to get the additional benefits of passive ventilation. 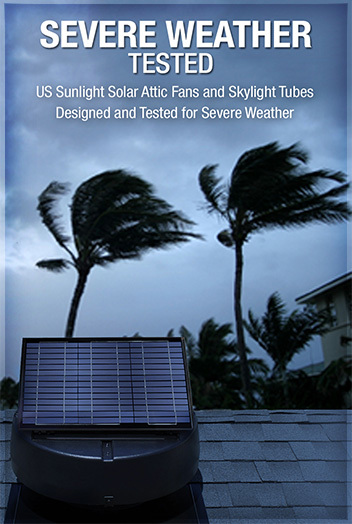 The thoughtfully designed Skylight Tubes from US Sunlight are designed to withstand most weather conditions. 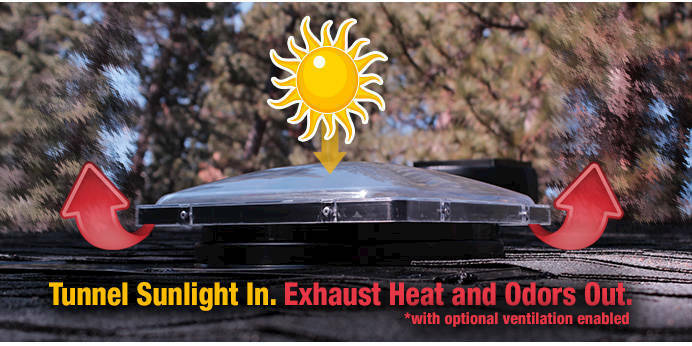 Even with the ventilation tabs installed on your roof dome, you can be confident that your Skylight Tube is weather-resistant in most rain, snow, and hail conditions. From product purchase to installation, Skylight Tubes are an easy and less expensive solution for your home’s daylighting requirements compared to traditional skylights and roof windows. 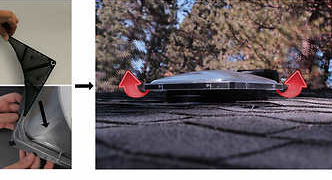 No reframing or major structural alterations are necessary to install a Skylight Tube. An installation professional should be able to install the product in about two hours and a do-it-yourselfer, in an afternoon. With its extended 8 to 12 foot flexible tubing, a Skylight Tube can be installed just about anywhere. The benefits of pure natural light have been proven in studies throughout the years. Clean natural light enhances mood, mental and physical well-being, concentration, and overall energy. It’s easier on the eyes and enhances the appeal and decor of any room in your house. Our entire lineup of Skylight Tubes has been tested for severe weather and all feature hail resistant polycarbonate or upgraded acrylic roof domes. 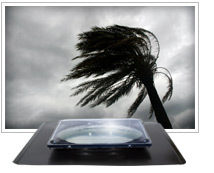 Spectrum Skylight Tubes have been tested for severe weather and are capable of withstanding a live load of over 260 lbs. Once installed, the Skylight Tube requires no maintenance. The high impact-resistant, upgraded acrylic comes standard and is engineered to repel dirt and other debris. With the optional Light Kit for Spectrum Skylight Tubes, the Skylight Tube is able to encompass the best of both worlds: natural light during the day and house powered light at night. By utilizing the sun’s natural light during the day, homeowners are still benefiting from the remarkable powers of the sun’s invigorating energy, and yet they are still able to use the same fixture into the evening with the optional Light Kit, giving them a true win-win situation.